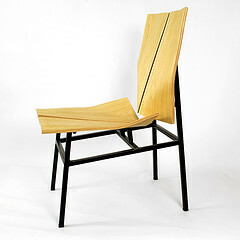 Ryan Tevebaugh (portfolio), an architecture student at NC State University about to enter his fifth year, produced this Origami chair for a furniture design course this spring. In this Flickr set you can see the progression as he moved from Rhino renders to the physical chair he produced in the shop. I love the form and contrast of materials. Be sure to check out the rest of the images on Flickr.